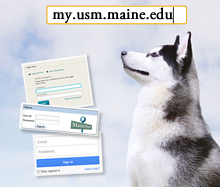 Login with your UMaine System ID and password (the same credentials used for MaineStreet and Blackboard). Because MyUSM uses single sign-on, while you are logged in, you are also simultaneously logged into other UMS applications such as Gmail, Blackboard, and MaineStreet. This means you can use the QuickLaunch icons and links to easily jump to these systems without logging in again. It also means that you must must sign out and close your browser to securely log out of all affiliated systems. The site header across the top of the page contains the main navigational menus and buttons. My Sites: this is a list of all communities in which the user is a member. [User's name]: links to the user's profile page, personalized settings, and Sign Out. Note: the portal will disconnect users automatically after two hours. For maximum security, users should sign out at the end of each session to ensure that they are also signed out of all other applications. When viewing the site on a mobile device, or in a narrow browser width, the Global Navigation menu collapses under a menu icon that displays at the top right of the page. Home: jump to the MyUSM home page. New Students: links to information and tasks for "confirmed" new USM students. Academics: this section contains links to academic information and applications for students, faculty and staff. Advising: this section features general advising information, timelines and tools for students and faculty; faculty advisors can also access a listing of their advisees. Student Services: links to a variety of campus services available to students. Campus Life: this section links to a variety of pages and sites pertaining to campus events, activities, groups, and services. Policies: this section contains links to USM and UMaine System policies. Libraries & Technology: this page features, search forms for Library OneSearch and Ask A Librarian, a listing of computing outages messages, and links to a variety of other library- and technology-related resources and services. Tools: this section includes a Document Library and Faculty and Staff lookup tool. Quick Launch Navigation appears on the home page as well as the top-level pages in the global navigation menu. Launch Pad Icons: these link to a number of applications and systems that take advantage of the portal's single sign-on functionality; you do not need to login again to access these systems. MaineStreet: this section contains deep links into frequently-used MaineStreet pages; the list of links available varies depending on your user role. UMS ID Management: these are links to UMaine System IT Services' account management systems. USM Quick Links: links to important USM web pages and frequently-used applications. Campus Portals: a listing of all campus portals with which the user is affiliated. If you spot something in the MyUSM Portal that is not working, or if you would like to see additional functionality that we have not yet included, please let us know! Send your questions, comments and suggestions to usm-webmaster@lists.maine.edu.